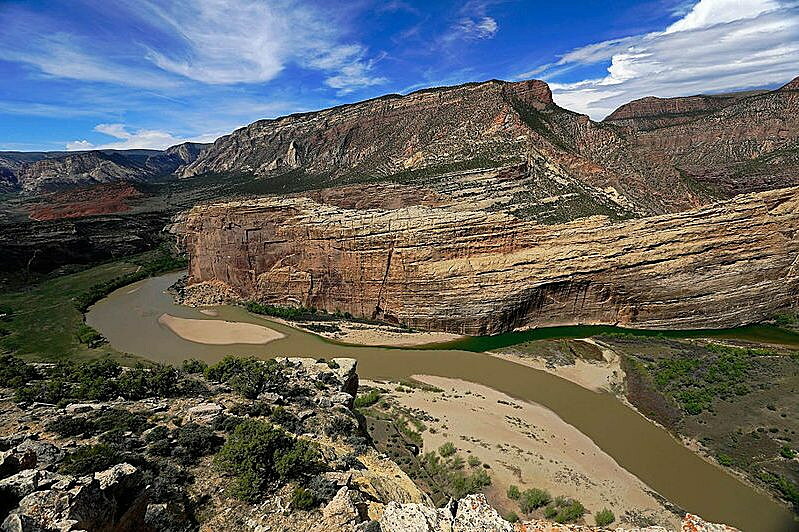 DENVER (Courthouse News) – Four environmental groups sued Interior Secretary Ryan Zinke on Thursday to protect the two-state Dinosaur National Monument from increased air pollution from oil and gas drilling. Established in 1915, the Dinosaur National Monument encompasses 200,000 acres from Rio Blanco County in northwest Colorado to northeast Utah counties Duchesne and Uintah. An estimated 300,000 people a year visit the park’s 1,500 fossils exposed on the cliff face inside the Quarry Exhibit Hall, spending around $18 million in local economies. According to lead plaintiff Rocky Mountain Wild, the Uinta Basin already “suffers from unhealthy ozone levels due to emissions from extensive oil and gas development.” But in December 2017 and June this year the Bureau of Land Management approved an additional 121 oil and gas leases on 117,720 acres, including some parcels within 3 miles of the monument. Under the Clean Air Act, the EPA has designated the Uinta Basin “an ozone nonattainment area.” The environmental groups consider the obvious culprit the 11,000 producing wells leased across Rio Blanco and the Uinta Basin. Plaintiffs include the National Parks Conservation Association, the Center for Biological Diversity and WildEarth Guardians. Their lead counsel is Stuart Gillespie with Earthjustice in Denver. In addition to its noxious effects on humans, ozone pollution also stunts vegetation growth. “During the winter, inversion layers trap nitrogen oxide and volatile organic compound emissions from oil-and-gas development in the basin, causing a build-up of exceedingly high levels of ozone. As a result, the Uinta Basin’s air quality has degenerated to a level that is sometimes worse than even the most polluted days in urban areas like Los Angeles and Denver,” according to the complaint. In addition to the plaintiffs’ commentary, BLM received comments from the National Park Service and 13,000 members of the public “raising concerns about the lease sale’s impacts on air quality, public health, and the environment,” which were inadequately addressed in the bureau’s environmental assessment, according to the complaint. The groups seek declaratory judgment that the leases violate the National Environmental Policy Act and the Federal Land Policy and Management Act, were issued arbitrarily and capriciously and beyond statutory authority, and want them vacated, plus costs of suit.